Do you have questions about what to do with some part of your library space? How to make it more user-friendly, liven it up, or incorporate a makerspace? Your colleagues have these same questions. If you’ve watched any of the free on-demand webinars on Demco’s Ideas + Inspiration site, you know we are fortunate to partner with smart folks who generously share their expertise and experiences. What you may not know is that each webinar has an archive of the questions attendees asked before or during the live session and our experts’ answers to them, along with helpful resources. Here we’re highlighting a few of the many questions posed as part of the Space Design collection of webinars. 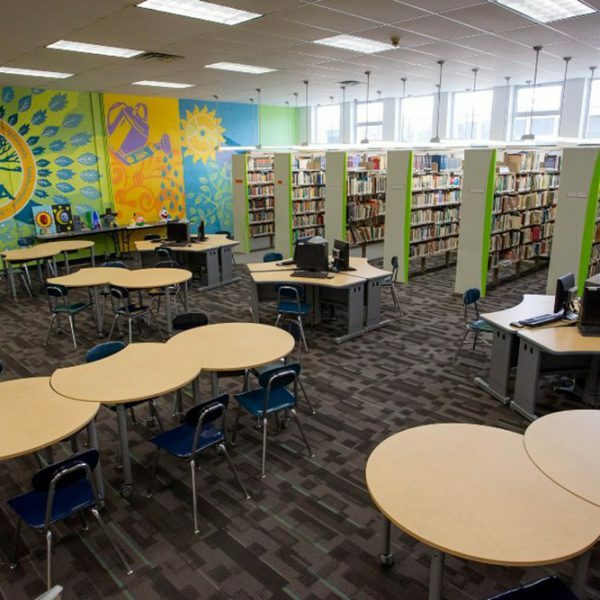 Question: How would you suggest segmenting the space when you're limited in size (I'm a middle school librarian)? 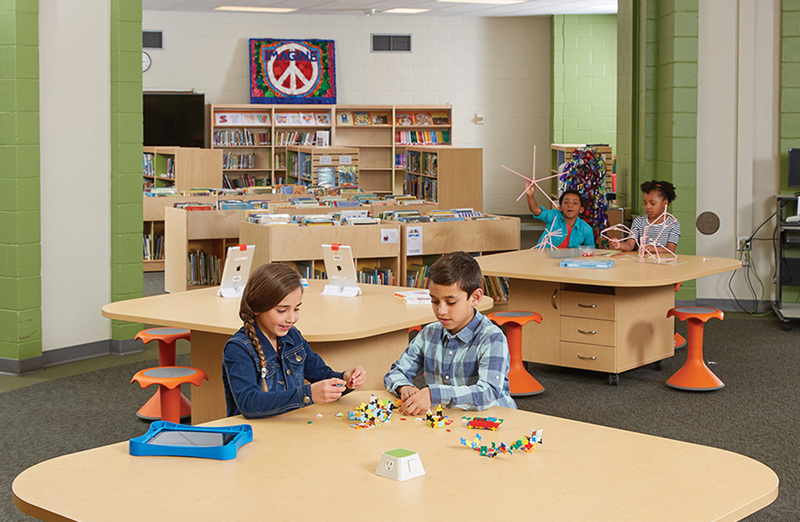 Kite® Mini Mobile Flip Tables are a popular choice for libraries looking to add flexibility to their spaces. When I think of some of the things described as multi-use or multi-functioning, I think of Alton Brown from the Food Network. He likes to talk about “the evilness of unitaskers” and how every tool in his kitchen needs to be a multi-tasker. That’s kind of how I think of the 21st century library, whatever kind of library it might be. Spaces need to be pressed into multiple types of service. So if you have only 1 table and chair available for studying, it may be that you need to design the space during the day so that it can be used for innovation or maker- or STEM-related activities, and at other times of the day it can be set aside for quiet study or research. It could be that you need to think about the kinds of tables or chairs that would allow for that to take place. It may be that you need to have craft paper on hand that can be spread out over a table so that when you are moving from a clean activity to a messy one, it can be done with minimal cleanup. Or it may be that you need to do some reconfiguration of a space to help you to find more space. Sometimes taking a fresh look at how your shelving is located and how windows are used (or not) can help free up space and create variety in your spaces. Question: Are makerspaces popular in elementary schools? What are some examples? 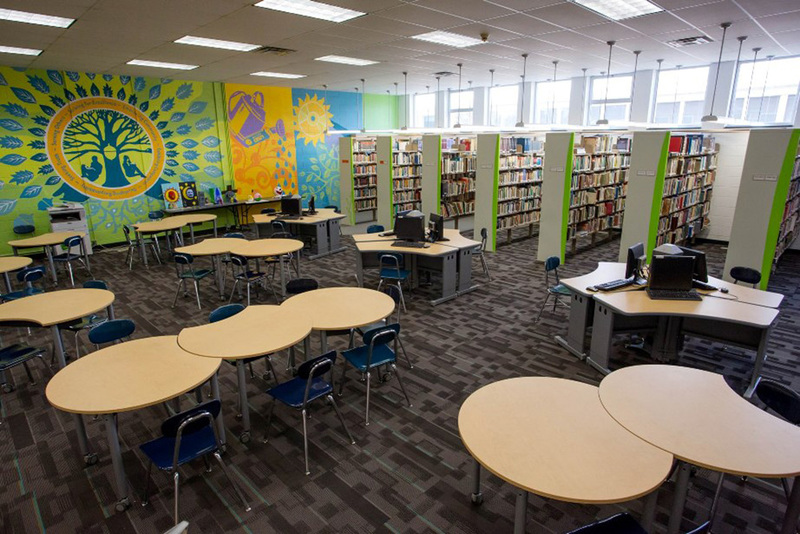 Tour Huegel Elementary School’s library renovation, which includes a dedicated makerspace. In the past year they have been rapidly implemented. The momentum in makerspaces was initially the strongest in middle schools, but is now being adopted by all types of schools. Remember that a makerspace doesn’t need to be elaborate. Many elementary schools have had activities for years, such as LEGO® Robotics Clubs, which are definitely maker activities; it’s all about hands-on learning and shared experiences. 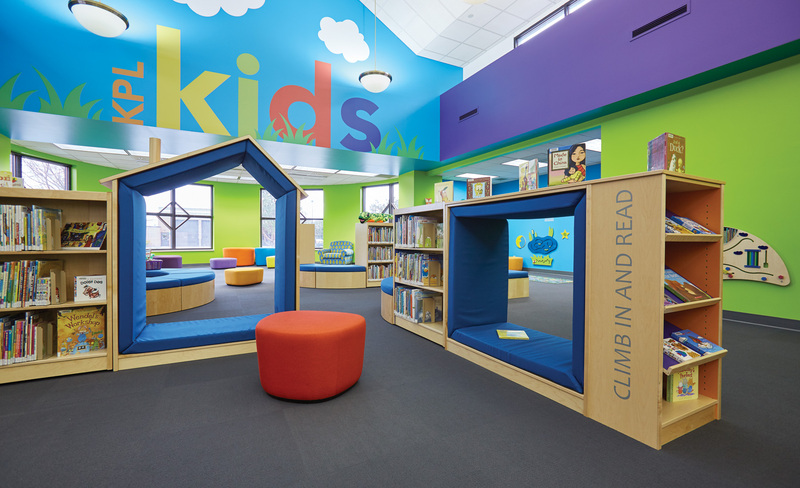 One of the examples that I showed in my presentation was from the Kaechele Elementary Library Learning Commons in Glen Allen, VA. They referred to their space as a Tinkerspace. Another example is Mason Elementary School, Cedar Park, TX, which has a very active makerspace and a lot of detail about developing makerspaces on their website. You’ll also find numerous makerspace related webinars and blog posts on our Ideas + Inspiration site. Question: Not all libraries have windows. We are in the middle of a high school building—no windows. I'm really trying to figure out how to bring in color and lighting to compensate. Color selections can have a big impact, but strong colors need to be carefully used. Strong colors focus attention and, used properly, can pull you into a space, but they can also close off a space. There are also great photo murals out there that you can create and have printed to cover a portion of a wall. This can create outdoor scenes or the feel of a window if you like. You can make it part of an art program in school to create changing art by creating a mural on a wall. It can change monthly or less frequently to draw interest. This creates a focus, and while you’re not able to have a changing view of the outside, the space can still be dynamic and changing inside. You can also use color to define focal points and create attention within the space. Ready to take your library to the next level with the right furniture and products? Request a consultation to have a DEMCO Interiors specialist help you maximize your new or renovated space. Question: We're hoping to add some comfortable seating in our Early Literacy area, for use by caregivers and children. Our color scheme is neutral shades of brown, plus some pops of yellow and yellow-green for accents. What colors would you suggest for furniture? I think violet and/or red-violet would add a lot of interest and excitement to the space. This would be based on a split-complementary color scheme. I would try to have some of the fabrics have a pattern with the violet or red-violet (magenta) as the dominant color, but still have some yellow and yellowgreen, and even brown in the fabric. Use www.Paletton.com, choose the “triad” dial at the top and then dial in your yellow and yellow-green. You should find that the red-violet hue should come up as the third color in the harmony. 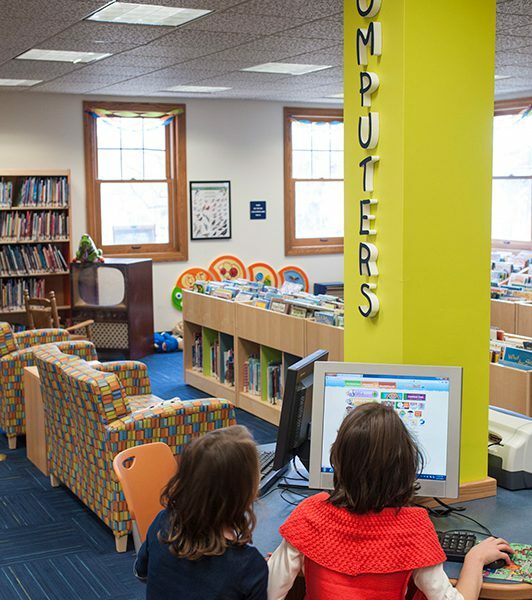 Question: What are your best suggestions for a small public library to arrange their computers so as not to seem like they are overwhelming the space? I am a big fan of incorporating computer workstations around columns and support beams. This is a great way to effectively use wasted space. It’s also easy and cost effective to wire. Even if you don’t have columns to work around, the idea of “computer pods,” or clusters, works very well for creating a less overwhelming feel. Just be sure to keep the furniture flexible, have good wire management, and have easy access to power so the area looks clean and can adapt into the future when desktop computers aren’t around. 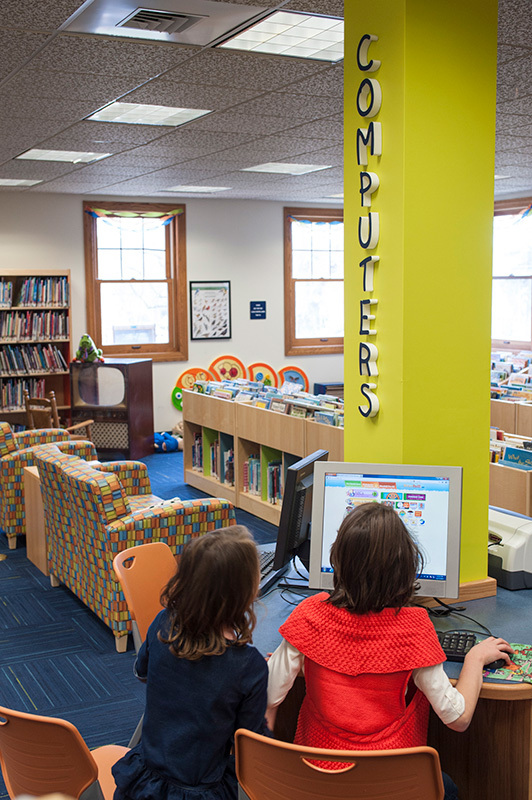 See more photos of the renovated children’s space at Joshua Hyde Public Library. 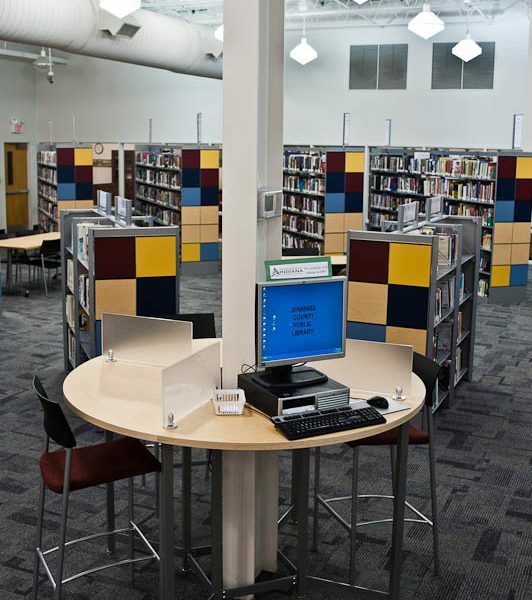 Jennings County Public Library used support beams to their advantage and designed a place for OPAC stations and touchdown work spaces. 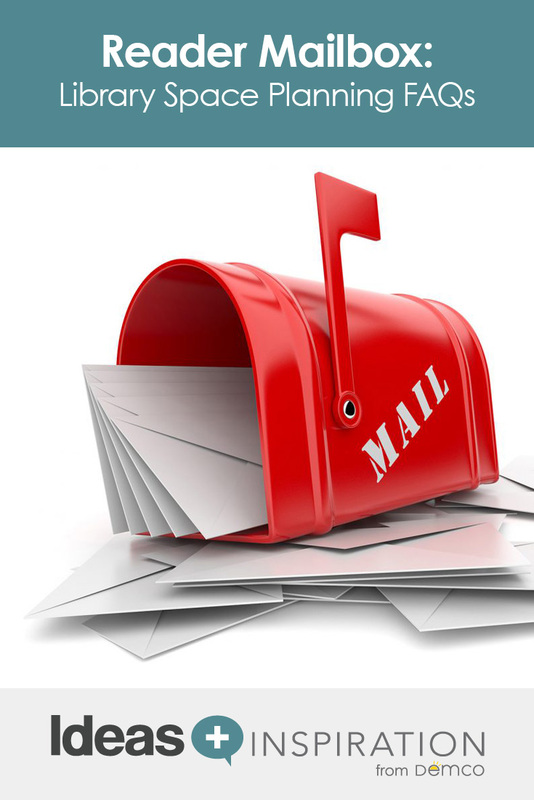 Need your questions answered? Consider ideas.demco.com the library for librarians. When you seek answers, this is a great place to start, as it’s loaded with helpful resources and project photos for inspiration and ideas. Pick your topic. 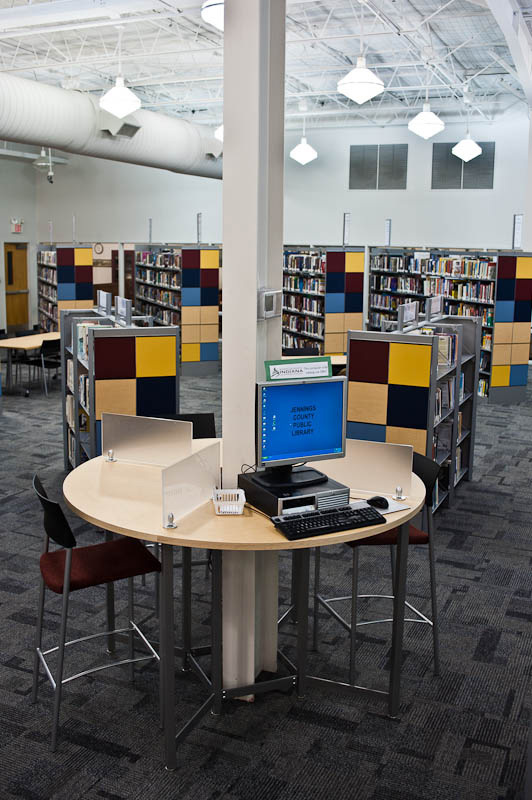 You can also consider DEMCO Interiors for help with your library space planning needs.